One of the things that West Virginians are best at is pulling together and making a difference in our communities. This ability is never more apparent than in our nonprofit sector. The Yew Mountain Center in Hilsboro exemplifies these qualities and more in their day to day work in the mountain state. The Yew Mountain Center was born from a small community tucked away down a windy road in Pocahontas County. In 2016, the property that is now the Center was for sale. Surrounding neighbors with a shared vision of conservation, education, and place-based prosperity joined together with a conservation-minded company and purchased the property. It is now a teaching and learning center on five hundred lush acres of beautiful mountaineer country. The Center is named after the Yew Pine, the colloquial name for the red spruce that grow there. The organization serves Pocahontas County and the surrounding area with educational and recreational programs for children and adults: a sort of “edu-vacation” as they like to call it, for families. This includes weekend programs about birds, herbs, bees, geology, crafts, fermentation, and more. The courses are family friendly and feature a mix of lectures, active participation, and free time to rest or explore the area’s trails, ponds, and waterfalls. Although there is a fee to be part of each weekend course, anyone can come to the presenter’s keynote address on Saturday nights for free. The Center’s staff and volunteers believe that by investing in the local economy, honoring cultural heritage, encouraging scientific and artistic discovery, and promoting ecological stewardship, the community will prosper and become more resilient. 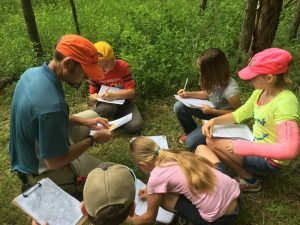 This spring, the Yew Mountain Center hosted Marlinton Elementary School’a 4th grade students on a social studies field trip. Students spent time in the forest learning about nature, topography, GPS, and how people use the land. After their hike, students made 3-D models of the Center’s topography and carefully created their own village that could thrive on the land. The Yew Mountain Center plans to continue collaborating with local schools to host field trips that encourage experiential learning in nature. For more information on The Yew Mountain Center, visit their website : www.yewmountain.org.